An on-board computer for a spaceship to calculate its course and perform other related tasks. Libby was assigned to the ballistic calculator, three tons of thinking metal that dominated the plotting room. He loved the big machine. The Chief Fire Controlman let him help adjust it and care for it. Libby subconsciously thought of it as a person -- his own kind of person. On the last day of the approach, the shocks were more frequent. Libby sat in the right-hand saddle of the calculator and droned out the predictions for the next salvo, while gloating over the accuracy with which the machine tracked. Obviously, RAH didn't invent the ballistic calculator, but he shows originality in applying the same ideas to moving an asteroid to a new orbit. 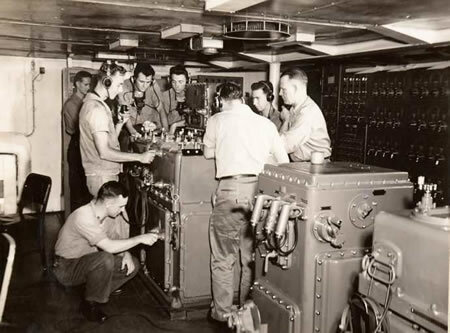 Heinlein graduated from US Naval Academy at Annapolis in 1929; in 1930 he learned how to run devices like the machines that coordinated a ship's main battery, like the Mark XVII Director and Mark III Range Keeper.